When our pit bull/Boxer mix died at the age of 12, our 1-year-old Chocolate Labrador, Bronte, became lonely. We looked at local shelters and pet adoption sites, but we couldn’t find a good match. 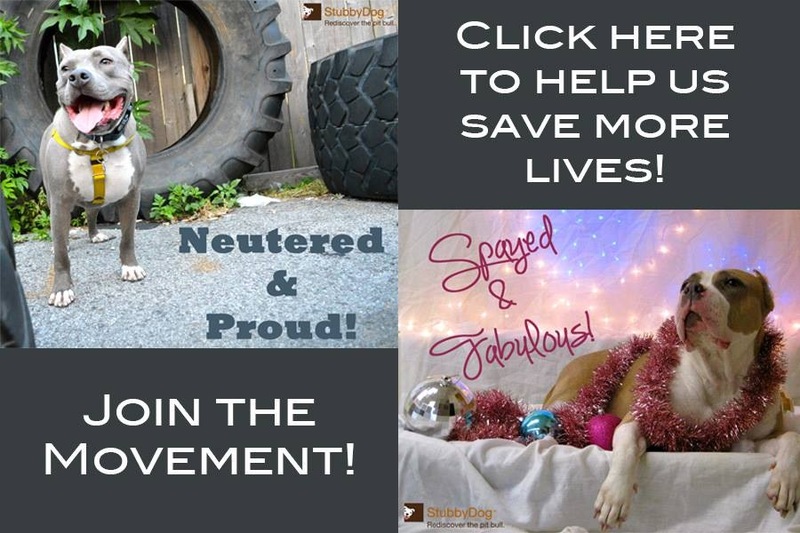 During this time, my daughter, Dr. Nicole Picht, DMV, was working an internship at a veterinary clinic in San Diego and had assisted in the surgery of a rescued 6-month-old pit bull mix from Even Chance Pit Bull Advocacy, Resources and Rescue. The surgery was to transform his ectrodactyly or “lobster claw” into a “mitten.” His name at the time was Claude. My daughter sent me a photo of the little guy. I kept going back to his picture and felt drawn to him. His charisma was working on me over the Internet. Finally, I told my husband that I thought this little guy was supposed to be ours. Rick, Bronte and I went to San Diego to meet Claude and to see if he and Bronte were compatible. It was a match. We decided then and there that Claude was to be a part of the family. We weren’t prepared to take him home that day, but made arrangements to pick him up the following week. We changed his name to Cody. Cody needed physical therapy, and since Bronte had to undergo therapy for hip trouble in the past, we knew K9’s Only was the perfect spot. As an added bonus, they offered obedience training. When we signed up, we learned Cody was a star. As Cody progressed with training, we’d go out in public, and people would come up to him to talk with him, pet him and rub his belly. Poor Bronte couldn’t understand why she wasn’t getting the same attention – after all, she was the beautiful Lab! But there was just something about Cody. Like I said before, this dog has charisma. People beg to take him home. One day, when I picked Cody and Bronte up from a play date at K9’s Only, the staff told me that Cody was starting to get an attitude. He was a bit sassy and wasn’t listening. By the way, he is a big talker. They suggested maybe going into advanced obedience training to keep him on track and to give me the tools to work more with him and to be able to let him off leash. During advanced training I learned that New Leash On Life, which works out of K9’s Only, had the Lend-A-Paw program which placed therapy dogs with schools, retirement homes and hospices in the area. 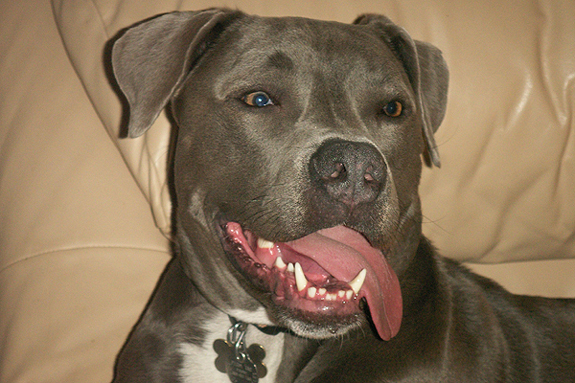 Cody was just about 1-year-old, and it was getting obvious to me that he was a people-oriented dog. I wondered if he’d make a good therapy dog, so I asked the trainer. At the end of advanced training, Cody and I took our test and became a certified therapy dog team. 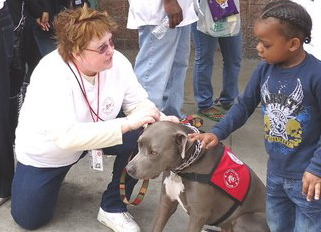 In fact, Cody is the first “pit bull” to be certified through Los Angeles’ Lend-A-Paw program! By April 2010 we were visiting retirement homes for an hour twice a month. Cody liked the visits and enjoyed the seniors. Although his breed surprises people, his charisma wins them over every time. Working is taxing on Cody and all therapy dogs. It may look easy and relaxed, but he really has to control himself, to keep calm when he’d rather be excited (and wiggle and talk and kiss), and to pay attention to so much around him – it is different and new to keep his emotions in check like that. When we get back from a visit he collapses for the rest of the day. All of the handlers talk about this and are amazed at how much it takes out of our dogs. Sometimes I worry that this might be something Cody does for me and doesn’t really like. But then we have days I know he loves what he is doing. He is proud of himself and glad to be the center of attention. Although Cody is composed when he’s working, when he’s at home it’s another story! He’s a typical, high-energy dog when not wearing his red therapy dog vest. Most people who see him at play, at home or on a walk are shocked to learn he is a therapy dog because his is so high energy. He runs, jumps, does everything any dog would do. 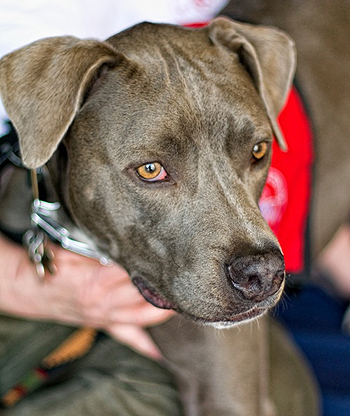 While therapy dogs have to be calm and obedient while working, the rest of the time they are – well – dogs! But when I get out that red vest or put on my Lend-A-Paw T-shirt, he knows what is coming, he knows we are about to go to work, and he settles in and does his job. And speaking of his job … right around the time I was writing this article, I learned that we are being honored with the Achievement Award from the Animal Farm Foundation! 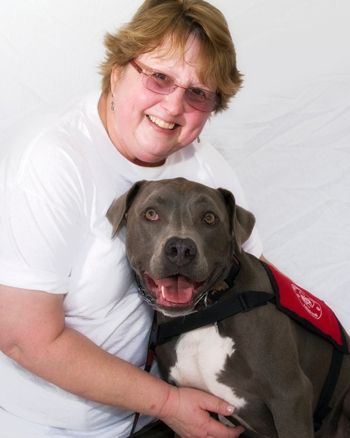 The award honors a dog and handler duo working together to win hearts and open minds, breaking stereotypes and disproving myths for all pit bull type dogs. It also earned a $1,000 grant for Even Chance. Cody and I are thrilled to be honored for our work, but we do it because it give us pleasure and hope – and the only accolades and recognition we want are the smiles, hugs, pets and love from those we serve.